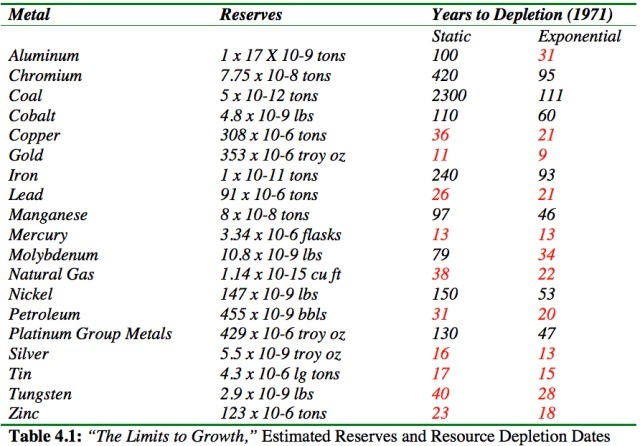 Anthony Watt has a nice catalog of past predictions of doom (e.g. running out of oil, food, climate issues, etc). It really would be funny if not such a serious and structural issue with the media. I would love to see someone like the NY Times have a sort of equivalent of their reader advocate whose job was to go through past predictions published in the paper and see how they matched up to reality. If I had more time, it is the blog I would like to start. 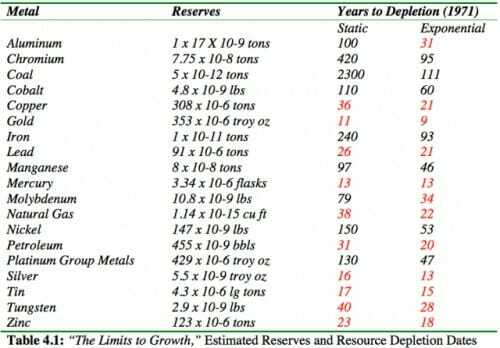 Update: One of his readers Dennis Wingo took the resource depletion table from Ehrlich's Limits to Growth and annotated it -- the numbers in red show the resources Ehrlich predicted we should already run out of. 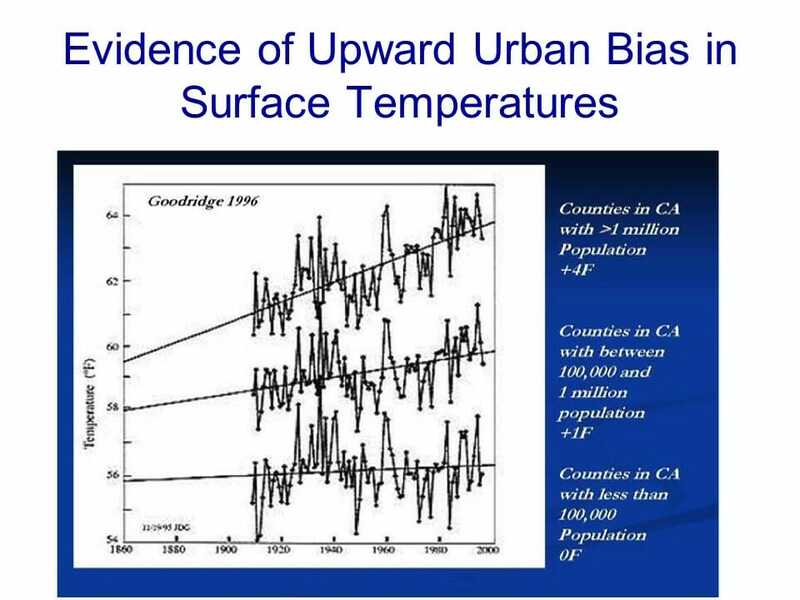 However, rather than ever, ever going back and visiting these forecasting failures and trying to understand the structural problem with them, the media still runs back to Ehrlich as an "expert". I feel the need to reproduce this email in its entirety. Here is Phil Jones actively hoping the world will warm (an outcome he has publicly stated would be catastrophic). The tribalism has gotten so intense that it is more important for his alarmist tribe to count coup on the skeptics than to hope for a good outcome for the Earth. >     Still a way to go before 2014. >   scale, but it would be nice to wear their smug grins away. > continually monitor the weather forecasts. >    it doesn't seem to have been as cold as the forecasts. > C for the LWC. >   the countryside 5-6 deg C cooler than city centres on recent nights. Is this better or worse than rooting for a bad economy to get your favorite politicians elected? 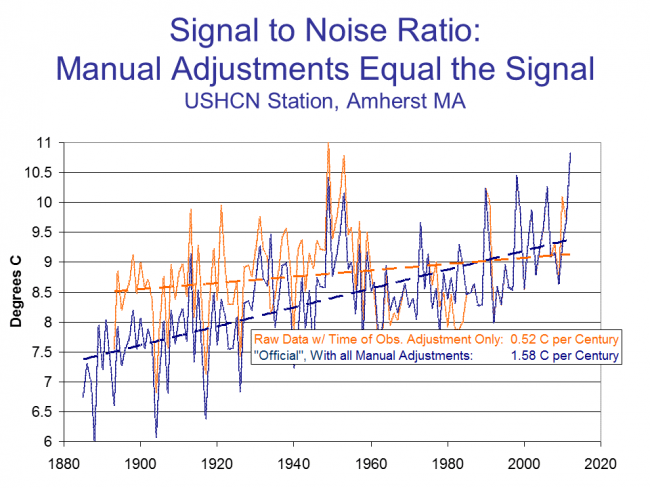 Anthony Watt has more in this same tone, showing how climate scientists were working to shift messages and invent new science to protect the warming hypothesis. 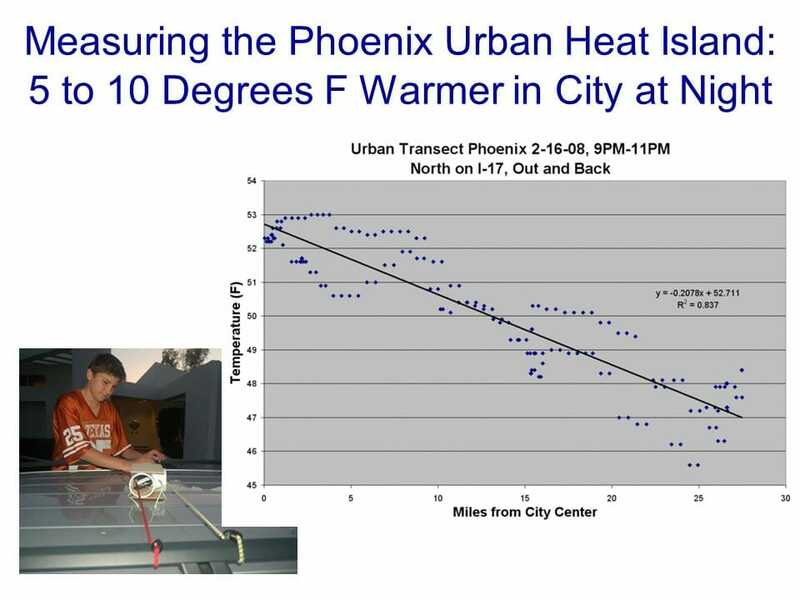 The last part about the UHI (urban heat island) study is interesting. I don't remember this study. 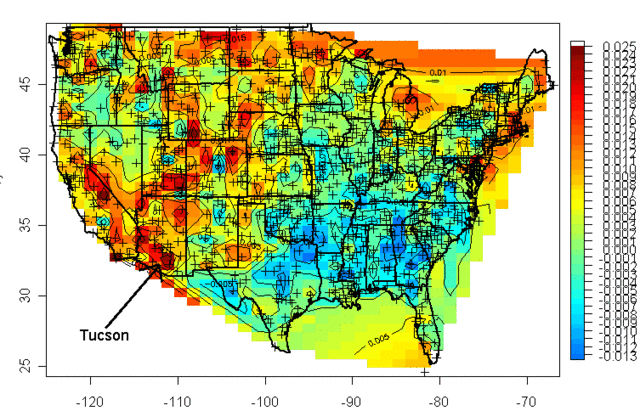 But it is interesting that he accepts a UHI of as high as 1.6C (my son and I found evening UHI in Phoenix around 4-6C, about in line with his London results). 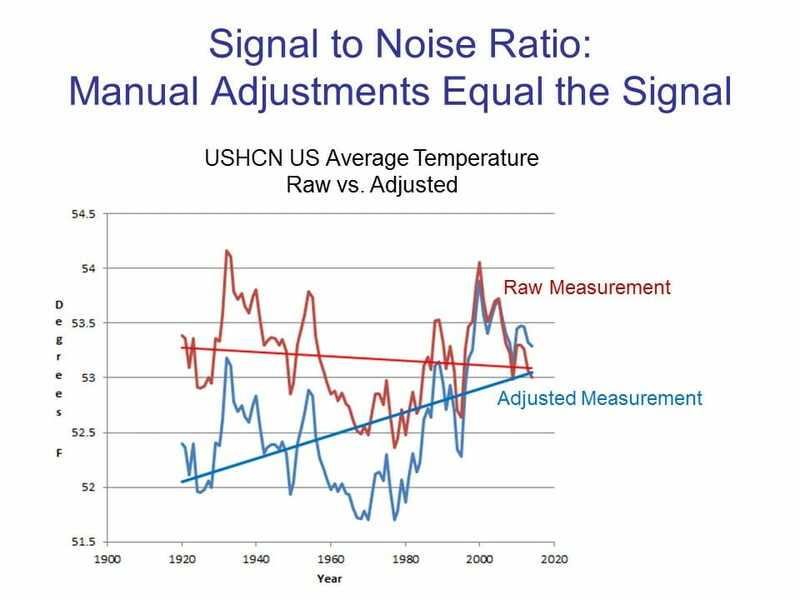 It looks like he is trying to say that UHI should not matter to temperature measurement, since it has not changed in London since 1900 (a bias in temperature measurement that does not change does not affect the temperature anomaly, which is what tends to be important). 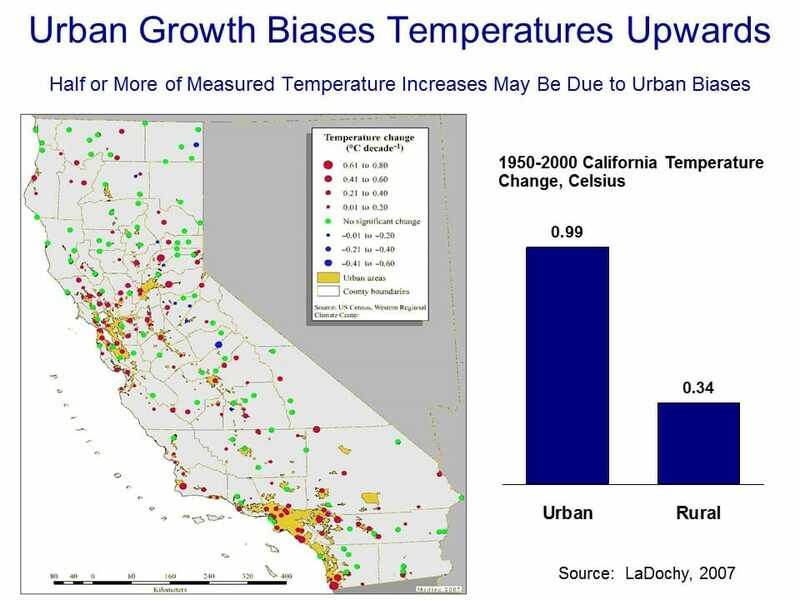 But the point is that many other temperature stations in the Hadley CRUT data base are in cities that are now large today but were much smaller than London in 1900 (Tucson is a great example). 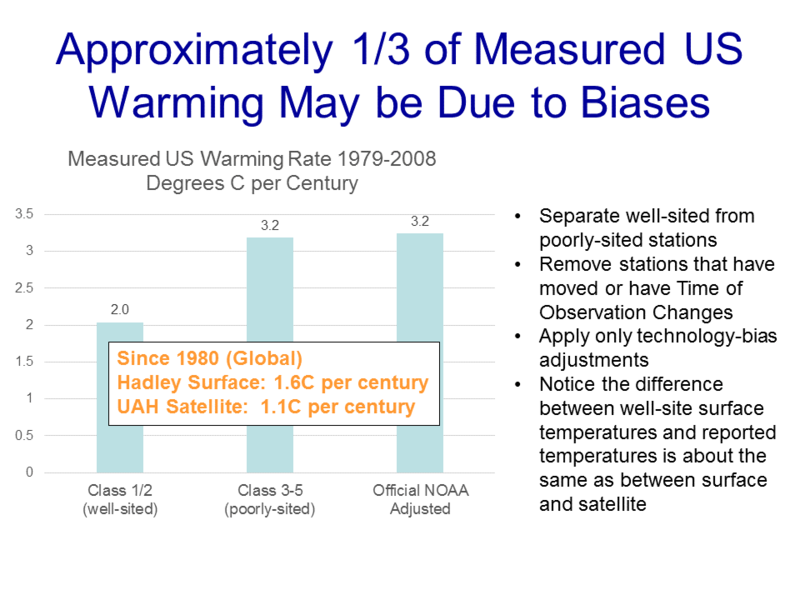 In these cases, there is a changing measurement bias that can affect the anomaly, so I am not sure what Jones was trying to get at. There are three threads in particular in the leaked documents which have sent a shock wave through informed observers across the world. Perhaps the most obvious, as lucidly put together by Willis Eschenbach (see McIntyre's blog Climate Audit and Anthony Watt's blog Watts Up With That), is the highly disturbing series of emails which show how Dr Jones and his colleagues have for years been discussing the devious tactics whereby they could avoid releasing their data to outsiders under freedom of information laws. This in itself has become a major scandal, not least Dr Jones's refusal to release the basic data from which the CRU derives its hugely influential temperature record, which culminated last summer in his startling claim that much of the data from all over the world had simply got "lost". Most incriminating of all are the emails in which scientists are advised to delete large chunks of data, which, when this is done after receipt of a freedom of information request, is a criminal offence. But the question which inevitably arises from this systematic refusal to release their data is "“ what is it that these scientists seem so anxious to hide? The second and most shocking revelation of the leaked documents is how they show the scientists trying to manipulate data through their tortuous computer programmes, always to point in only the one desired direction "“ to lower past temperatures and to "adjust" recent temperatures upwards, in order to convey the impression of an accelerated warming. This comes up so often (not least in the documents relating to computer data in the Harry Read Me file) that it becomes the most disturbing single element of the entire story. This is what Mr McIntyre caught Dr Hansen doing with his GISS temperature record last year (after which Hansen was forced to revise his record), and two further shocking examples have now come to light from Australia and New Zealand. 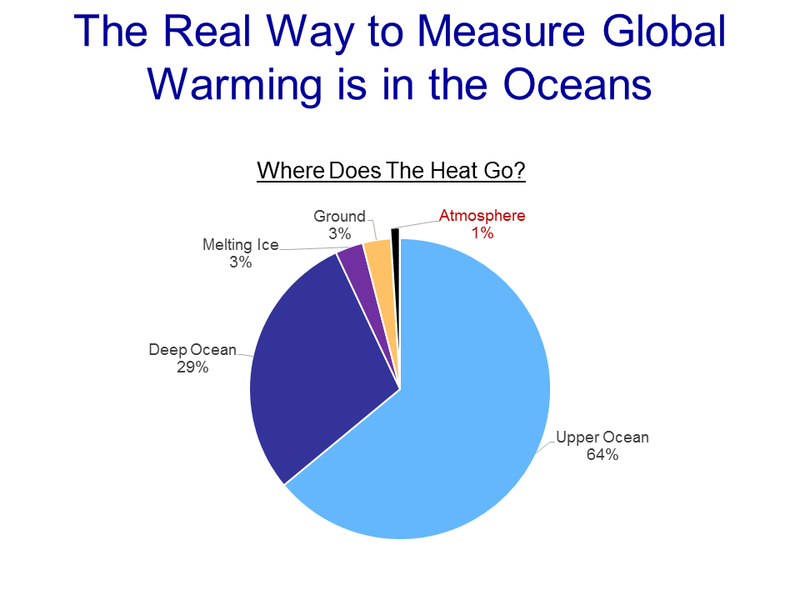 In each of these countries it has been possible for local scientists to compare the official temperature record with the original data on which it was supposedly based. 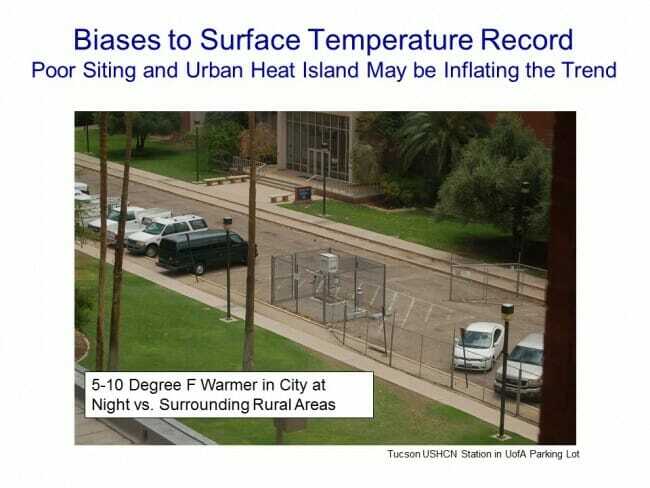 In each case it is clear that the same trick has been played "“ to turn an essentially flat temperature chart into a graph which shows temperatures steadily rising. And in each case this manipulation was carried out under the influence of the CRU. The third shocking revelation of these documents is the ruthless way in which these academics have been determined to silence any expert questioning of the findings they have arrived at by such dubious methods "“ not just by refusing to disclose their basic data but by discrediting and freezing out any scientific journal which dares to publish their critics' work. It seems they are prepared to stop at nothing to stifle scientific debate in this way, not least by ensuring that no dissenting research should find its way into the pages of IPCC reports. In a landmark ruling, Mr Justice Michael Burton said that "a belief in man-made climate change "¦ is capable, if genuinely held, of being a philosophical belief for the purpose of the 2003 Religion and Belief Regulations". The ruling could open the door for employees to sue their companies for failing to account for their green lifestyles, such as providing recycling facilities or offering low-carbon travel. John Bowers QC, representing Grainger, had argued that adherence to climate change theory was "a scientific view rather than a philosophical one", because "philosophy deals with matters that are not capable of scientific proof." That argument has now been dismissed by Mr Justice Burton, who last year ruled that the environmental documentary An Inconvenient Truth by Al Gore was political and partisan. The decision allows the tribunal to go ahead, but more importantly sets a precedent for how environmental beliefs are regarded in English law. Wow! Its a religion, not a scientific position. I probably should be laughing, but I'm not. State officials deliberately underestimated the cost of Gov. Ted Kulongoski's plan to lure green energy companies to Oregon with big taxpayer subsidies, resulting in a program that cost 40 times more than unsuspecting lawmakers were told, an investigation by The Oregonian shows. According to documents obtained under Oregon's public records law, agency officials estimated in a Nov. 16, 2006, spreadsheet that expanding the tax credits would cost taxpayers an additional $13 million in 2007-09. But after a series of scratch-outs and scribbled notes, a new spreadsheet pared the cost to $1.8 million. And when energy officials handed their final estimate to the Legislature in February 2007, they pegged the added cost at just $1.2 million for the first two years and $4.1 million for 2009-11. The higher estimates were never shown to lawmakers. Current and former energy staffers acknowledged a clear attempt to minimize the cost of the subsidies. "I remember that discussion. Everyone was saying, yes, this is going to be a huge (budget) hit," recalled Charles Stephens, a former analyst for the Energy Department who left in 2006. "The governor's office was saying, 'No, we need a smaller number.'" Hmm, sounds eerily like what is going on with the health care bill in Congress. Update: It turns out that all of the "green" companies so far have sold their tax credits for cash to companies like Wal-Mart and US Bank. This is no enormous problem (though the optics are terrible for the state) but it is yet another reason why the Oregon budget gets busted by this program -- a startup solar company won't use tax credits for years as it will take some time to be profitable (if they ever are) but Wal-Mart can use them right now. (b) Africa, in the context of environmental justice, should be equitably compensated for environmental, social and economic losses arising from the implementation of response measures. Compensating for "lost opportunities?" Isn't that number just whatever they want it to be? And don't get me started on lost "dignity." Anthony Watt has an interesting story of a senior NASA official using his government position to pressure textbook manufacturers to change their books to reflect his view of the world. Over at Climate Skeptic, I discuss Anthony Watt's preliminary findings as to the quality of measurement in the surface temperature installations that are used to measure global warming. If we call global warming "the signal", then the signal is currently thought to have been about 0.6C over the last century. However, Watt has good reason to estimate that 85% of the US Historical Climate Network has installation biases that create errors from 1-5C,or about 2-8 times the signal. And these are not random biases that cancel out, but tend to all bias the numbers higher, leading to systematic over-estimation of temperature increases.